With hopes brightening that President Obama is close to a negotiated settlement of the Iran nuclear dispute, Mitt Romney’s campaign is eager to counter any positive news. The moment is reminiscent of past October Surprise moments, says Robert Parry in this article adapted from America’s Stolen Narrative. The phrase “October Surprise” is now part of the American political lexicon, referring to some last-minute event that might change the course of a U.S. presidential election. But the two prototypical “October Surprise” cases, in 1968 and 1980, have never earned a place in mainstream American history. The October Surprise allegations of 1968 and 1980 also were something of a misnomer since they centered on Republican efforts to block an October Surprise by sabotaging game-changing diplomatic successes by incumbent Democratic presidents. In 1968, it was Lyndon Johnson achieving a breakthrough in the Vietnam War peace talks. In 1980, it was Jimmy Carter securing the release of 52 American hostages held in Iran. 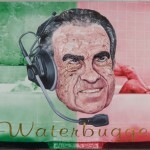 President Richard Nixon in Robbie Conal’s painting, “Waterbugger,” at robbieconal.com. In both cases, the Democratic presidents failed to accomplish their goals and the Republican candidates, Richard Nixon in 1968 and Ronald Reagan in 1980, went on to victories. 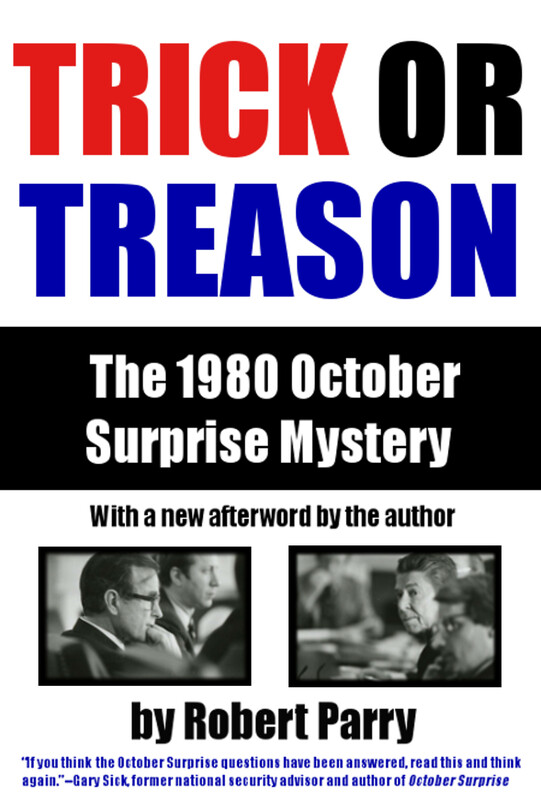 Yet, these important October Surprise mysteries have remained largely unsolved: Did Republican sabotage actually play a role in the Democratic failures? Recent disclosures from the National Archives as well as statements from participants have shed new light on these dark chapters of U.S. history and revealed previously unknown links between the 1968 case and the Watergate scandal of 1972 and between the 1980 Iran-hostage case and the Iran-Contra Affair of 1985-86. The new evidence suggests a more continuous narrative connecting these scandals and thus represents a powerful challenge to the established history. Possibly the most notorious “October Surprise” case and the first of this modern era occurred in fall 1968 when Republican Richard Nixon was locked in a tight presidential race with Democratic nominee, Vice President Hubert Humphrey, and President Johnson was making progress in Vietnam peace negotiations. At that point, a half million American soldiers were in the war zone and more than 30,000 had already died, along with Vietnamese dead estimated at about one million. In late October 1968, Johnson saw a chance for a breakthrough that would involve a bombing halt of North Vietnam and a possible framework for peace. However, Johnson encountered surprising resistance from U.S. allies in South Vietnam. President Nguyen van Thieu was suddenly laying down obstacles to a possible settlement in the Paris peace talks. On Oct. 29, 1968, Johnson got his first clear indication as to why. According to declassified records at the LBJ Library in Austin, Texas, Eugene Rostow, Johnson’s Under Secretary of State for Political Affairs, got a tip from Wall Street financier Alexander Sachs who said that one of Nixon’s closest financial backers was describing Nixon’s plan to “block” a peace settlement. Nixon’s backer was sharing this information at a working lunch with his banking colleagues in the context of helping them place their bets on stocks and bonds. In other words, the investment bankers were colluding over how to make money with their inside knowledge of Nixon’s scheme to extend the Vietnam War. From the FBI wiretaps, Johnson quickly learned about the role of Nixon campaign official (and right-wing China Lobby figure) Anna Chennault contacting South Vietnam’s Ambassador to the United States Bui Diem regarding the political importance for President Thieu’s continued boycott of the Paris peace talks. After reading these secret FBI cables, Johnson began working the phones to counter the Nixon campaign’s gambit. According to recordings of the phone calls that have since been declassified, Johnson complained to Senate Republican Leader Everett Dirksen about the subterfuge. On Nov. 2, just three days before the election, an angry Johnson telephoned Dirksen at 9:18 p.m., to provide details about Nixon’s activities and to urge Dirksen to intervene forcefully. After hearing from Dirksen, Nixon grew concerned that Johnson might just go public with his evidence of the conspiracy. At 1:54 p.m. on Nov. 3, trying to head off that possibility, Nixon spoke directly to Johnson, according to an audiotape released by the LBJ Library. After the conversation with Nixon, Johnson continued to consider whether he should go public with Nixon’s “treason.” A last-minute opportunity arose when a Christian Science Monitor correspondent in Saigon, Beverly Deepe, got word from South Vietnamese sources about the pressure on Thieu from the Nixon campaign to block the peace talks. So, on Nov. 4, journalist Saville Davis from the Monitor’s Washington bureau checked out Deepe’s story with South Vietnamese Ambassador Bui Diem and with the White House. Bui Diem knocked the story down and the decision by the White House on whether to confirm the story went to President Johnson himself. In a conference call, Johnson consulted with Secretary of State Dean Rusk, Defense Secretary Clark Clifford and Walt Rostow. All three advisers recommended against going public, mostly out of fear that the scandalous information might reflect badly on the U.S. government. Thus, the American electorate went to the polls on Nov. 5 with no knowledge that Johnson’s failed peace talks may have been sabotaged by Nixon’s campaign. Nixon prevailed over Humphrey by about 500,000 votes or less than one percent of the ballots cast in one of the closest elections in U.S. history. Faced with Johnson’s threat, Nixon promised to tell the South Vietnamese officials to join the peace talks. However, nothing changed. For LBJ, there would be no peace. As Inauguration Day approached, an embittered President Johnson ordered his national security aide Walt Rostow to remove from the White House the file containing the secret evidence of this “sordid story,” a decision that would have its own unintended consequences. After taking office, President Nixon was told by FBI Director J. Edgar Hoover about Johnson’s wiretaps. But Hoover gave Nixon the impression that the bugging was more intrusive and widespread than it actually was. Nixon launched an internal search for the file containing the secret wiretaps, but to no avail. For Nixon, the missing file emerged as a deepening concern in June 1971 when The New York Times began publishing excerpts from the leaked Pentagon Papers, a study of the Vietnam War from 1945 to 1967 that revealed U.S. government deceptions especially by the Johnson administration. But Nixon knew something that few others did, that there was a potential sequel to the Pentagon Papers, a file on his campaign’s treachery in undercutting Johnson’s peace initiative and in extending the ruinous Vietnam War. Just four days after the Times began publishing the Pentagon Papers, one of Nixon’s Oval Office tapes on June 17, 1971 records him demanding extraordinary measures to locate the missing file. Nixon’s team referred to it as related to Johnson’s Vietnam bombing halt of Oct. 31, 1968, but it encompassed LBJ’s failed peace effort and more importantly the apparent Republican sabotage. In the wake of the public outrage over the Pentagon Papers, Nixon clearly would have understood the danger to his reelection campaign if the second shoe had dropped, the revelation of Nixon’s role in extending the war to help win an election. The Oval Office conversation on June 17, 1971, is the first transcript in Stanley I. Kutler’s Abuse of Power, a book of Nixon’s recorded White House conversations relating to Watergate, and suggests Nixon had been searching for the 1968 file for some time. But Johnson did know that the file was no longer at the White House because he had ordered Walt Rostow to remove it in the final days of his own presidency. On June 30, 1971, Nixon again berated Haldeman about the need to break into Brookings and “take it [the file] out.” Nixon even suggested using former CIA officer E. Howard Hunt (who later oversaw the two Watergate break-ins in May and June of 1972) to conduct the Brookings break-in. Nixon: “That’s right. You go in to inspect the safe. I mean, clean it up.” For reasons that remain unclear, it appears that the planned Brookings break-in never took place, but Nixon’s desperation to locate Johnson’s peace-talk file was an important link in the chain of events that led to the creation of Nixon’s Plumbers unit and then to Watergate. Ironically, Walt Rostow made that link in his own mind when he had to decide what to do with the file in the wake of Johnson’s death on Jan. 22, 1973. In the preceding four years, Rostow had come to label the file “The ‘X’ Envelope,” a name that he wrote in longhand on the file’s cover. On May 14, 1973, as he pondered what to do with the file, the Watergate scandal was spinning out of Nixon’s control. In a three-page “memorandum for the record,” Rostow summarized what was in “The ‘X’ Envelope” and provided a chronology for the events in fall 1968. Rostow reflected, too, on what effect LBJ’s public silence may have had on the unfolding Watergate scandal. Rostow had a unique perspective in understanding the subterranean background to Nixon’s political espionage operations. Rostow apparently struggled with this question for the next month as the Watergate scandal continued to expand. On June 25, 1973, fired White House counsel John Dean delivered his blockbuster Senate testimony, claiming that Nixon got involved in the cover-up within days of the June 1972 burglary at the Democratic National Committee. Dean also asserted that Watergate was just part of a years-long program of political espionage directed by Nixon’s White House. Since the audiotapes from many of Johnson’s phone conversations have also been declassified, it is now possible to overlay the information that Johnson had from the FBI wiretaps upon his conversations with Nixon and other principals and thus get a fuller sense of the high-stakes drama. Yet, Rostow’s delay in releasing “The ‘X’ Envelope” had other political consequences. Since the full scope of Nixon’s political intelligence operations were not understood in 1973-74, Washington’s conventional wisdom adopted the mistaken lesson that “the cover-up is worse than the crime.” What wasn’t understood was how deep Nixon’s villainy may have gone. That context also wasn’t known when a reprise of the 1968 “October Surprise” gambit may have played out in 1980. As that election campaign wound down, President Jimmy Carter was struggling to secure the release of 52 American hostages seized at the U.S. Embassy in Tehran on Nov. 4, 1979, and Republican operatives again were alleged to have gone behind the President’s back. The hostages were kept in Iran until Reagan was sworn in on Jan. 20, 1981. Over the years, about two dozen sources including Iranian officials, Israeli insiders, European intelligence operatives, Republican activists and even Palestinian leader Yasser Arafat have provided information about alleged contacts with Iran by the Reagan campaign. This October Surprise controversy finally drew some official attention in 1991-92 around the question of whether Ronald Reagan’s secret arms sales to Iran in 1985-86 the Iran-Contra Affair had originated several years earlier via his campaign’s contacts with Iran during Carter’s hostage crisis in 1980. There were indications early in the Reagan presidency that something peculiar was afoot. On July 18, 1981, an Israeli-chartered plane crashed or was shot down after straying over the Soviet Union on a return flight from delivering U.S.-manufactured weapons to Iran. In 1993, I took part in an interview with former Israeli Prime Minister Yitzhak Shamir in Tel Aviv during which he said he had read the 1991 book, October Surprise, by Carter’s former National Security Council aide Gary Sick, which made the case for believing that the Republicans had intervened in the 1980 hostage negotiations to disrupt Carter’s reelection. “Of course, it was,” Shamir responded without hesitation. “It was.” Later in the interview, Shamir seemed to regret his frankness and tried to backpedal on his answer, but his confirmation remained a startling moment. In 1996, while former President Carter was meeting with Palestine Liberation Organization leader Arafat in Gaza City, Arafat tried to confess his role in the Republican maneuvering to block Carter’s Iran-hostage negotiations. But many of these additional details surfaced only after the 1980 case was buried by a House task force investigation that concluded in January 1993 that there was “no credible evidence” to support the allegations of a Republican sabotage operation behind Carter’s back. That finding allowed “October Surprise” to be treated as something of a conspiracy theory. Newly declassified records from the National Archives and statements by key investigators, however, have undermined the House task force’s conclusions. For instance, a pivotal moment in the October Surprise investigation came in mid-November 1991 when two magazines, Newsweek and The New Republic, mocked the suspicions as a myth. The impact of that dual debunking was profound, emboldening Senate Republicans to filibuster funding for a planned Senate inquiry and taking the wind out of a parallel House task force which, afterwards, focused more on disproving the allegations than confirming them. A central element of those debunking stories was a supposed alibi for Reagan’s campaign chief William Casey, who had been placed in Madrid by one Iranian witness, Jamshid Hashemi, for a two-day meeting with an Iranian emissary, Mehdi Karrubi, in late July 1980. As it turned out, Casey had broken off from the campaign in late July to attend a historical conference in London, putting him a short flight from Madrid. However, the two newsmagazines cited attendance records from the conference as showing Casey there for a morning session on July 28, thus supposedly making Hashemi’s account of a two-day meeting impossible. In fall 1991, I was working at PBS “Frontline” on a documentary about the 1980 October Surprise case and we did what the two newsmagazines didn’t do. We interviewed other Americans who had attended that day’s conference, including the speaker, historian Robert Dallek, who said he had looked for Casey in the modest-sized conference room and discovered he wasn’t there. The House task force interviewed Dallek, too, and quietly repudiated the London alibi. But the task force then created a different alibi for Casey on that weekend, placing him at the exclusive Bohemian Grove in northern California, although the Grove’s records and contemporaneous notes by a Grove member put Casey at its Parsonage cottage on the first weekend of August, not the last weekend of July. The task force even found a group photo of the Parsonage guests and members for the last weekend of July and Casey wasn’t in it. Still, the Bohemian Grove alibi became a key feature in the House task force’s conclusion rejecting Hashemi’s testimony and dismissing the broader October Surprise allegations. Yet, a recently released document from the George H.W. Bush Presidential Library in College Station, Texas, reveals that by early November 1991 as Newsweek and The New Republic were putting the finishing touches on their London alibi Bush’s White House counsel’s office was being informed that Casey had traveled to Madrid. State Department legal adviser Edwin D. Williamson told associate White House counsel Chester Paul Beach Jr. that among the State Department “material potentially relevant to the October Surprise allegations [was] a cable from the Madrid embassy indicating that Bill Casey was in town, for purposes unknown,” Beach noted in a “memorandum for record” dated Nov. 4, 1991. The archival records also reveal that Bush’s White House, facing an increasingly tough reelection fight in 1992, coordinated with other federal agencies and congressional Republicans to delay, discredit and destroy the October Surprise investigation. As assistant White House counsel Ronald von Lembke, put it, the goal was to “kill/spike this story.” To achieve that desired result, the Republicans coordinated the counter-offensive through the office of White House counsel C. Boyden Gray, under the supervision of associate counsel Janet Rehnquist, the daughter of the late Chief Justice William Rehnquist. White House “talking points” on the October Surprise investigation urged restricting the inquiry to 1979-80 and imposing strict time limits for issuing its findings. “Alleged facts have to do with 1979-80 no apparent reason for jurisdiction/subpoena power to extend beyond,” the document said. “There is no sunset provision this could drag on like Walsh!” a reference to Iran-Contra special prosecutor Lawrence Walsh. Bush’s White House was particularly concerned that the October Surprise investigation of alleged contacts with Iran in 1980 might merge with the Iran-Contra scandal which was then focused on events from 1985-86. If the firebreak separating the two scandals was jumped in the months before Election 1992, Bush’s already dimming hopes might have been dashed. In retracing these investigations in 2010-12, I also discovered that there was much greater doubt inside the House task force than its dismissive conclusions suggested. For instance, chief counsel Lawrence Barcella told me in e-mails that so much incriminating evidence against the Republicans arrived near the end of the task force’s investigation that he asked the task force’s chairman, Rep. Lee Hamilton, to extend the inquiry for three more months. However, Barcella said Hamilton declined to go through the necessary reauthorization of the task force and instead ordered him to proceed with the final report, which was published on January 13, 1993, and concluded that there was “no credible evidence” behind the suspicions. In 2010, when I asked Hamilton about why he had rejected Barcella’s request for an extension, the centrist Indiana Democrat said he had no recollection of such a proposal. Barcella and Hamilton also differed on whether Barcella had forwarded to Hamilton an extraordinary report from the Russian government about what Moscow’s intelligence files showed about the alleged contacts between Americans and Iranians in 1980 and beyond. The report, which had been requested by Hamilton and was addressed to him, was provided by Sergey V. Stepashin, chairman of the Supreme Soviet’s Committee on Defense and Security Issues. It was translated by the U.S. Embassy in Moscow and forwarded to the House task force on Jan. 11, 1993, just two days before the task force’s final report was to be released. The Russian Report contradicted the task force’s findings. As described by the Russians, the 1980 hostage negotiations boiled down to a competition between the Carter administration and the Reagan campaign offering the Iranians different deals if the hostages were either released before the election to help Carter or held until after the election to benefit Reagan. The Iranians “discussed a possible step-by-step normalization of Iranian-American relations [and] the provision of support for President Carter in the election campaign via the release of American hostages,” according to the U.S. Embassy’s classified translation of the Russian report. Both the Reagan-Bush Republicans and the Carter Democrats “started from the proposition that Imam Khomeini, having announced a policy of ‘neither the West nor the East,’ and cursing the ‘American devil,’ imperialism and Zionism, was forced to acquire American weapons, spares and military supplies by any and all possible means,” the Russian Report said. According to the Russians, the Republicans won the bidding war. “After the victory of R. Reagan in the election, in early 1981, a secret agreement was reached in London in accord with which Iran released the American hostages, and the U.S. continued to supply arms, spares and military supplies for the Iranian army,” the Russian Report continued. What became clear from my reexamination of both the 1968 and the 1980 “October Surprise” cases was that there was a resistance among both Republicans and Democrats to dig too deeply into these mysteries for fear that the discoveries would devastate the political comity upon which national governance rests. Yet, while the old saying asserts that “ignorance is bliss,” the absence of a truthful history is harmful to a vibrant democracy. Also, by pretending that these historical “October Surprise” cases are entirely mythical makes a recurrence more likely. 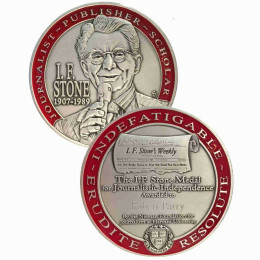 You can buy America’s Stolen Narrative either in print here or electronically (from Amazon and barnesandnoble.com). If you buy a hard copy of the book through the Consortiumnews.com Web site, you will not only get free shipping but for only a nickel more you can get one of the companion books, Secrecy & Privilege or Neck Deep. 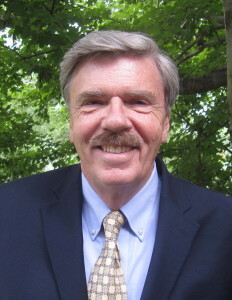 Robert Parry broke many Iran-Contra stories for The Associated Press and Newsweek in the 1980s. In the early 1990s, he worked on two PBS documentaries regarding the 1980 October Surprise case. His new book on these and other historical mysteries is America’s Stolen Narrative. Finally an October Surprise in September time enough to deal with it before the election, an attempt to create a bloodbath by Coptic Christians who raised money for a film supposedly on them being mistreated in Egypt while right-wingers raised money for a movie insulting bin Laden, and actors acted in a movie about a man who at first didn’t know who his father was, loved his donkey, never needed a shave and had a far away look in him eyes and somehow related to a spaceship landing 2000 years ago. If Consortium News doesn’t expose who is behind this October surprise before November, it will have many more future October Surprises to cry about. You cannot negotiate with these people. They are not our friends and they DO NOT like us. The only way to deal with them is to force them to respect us. We need to stop fooling ourselves. Listen to an articulate, educated Iranian woman, who escaped Iran after the Islamic Revolution, tell her story. She speaks the truth about Iran’s intentions – past and present. When Alan Spector tried to set up a Truth Commission probably after second thoughts in cooling the Kennedy Assassination moles in the protest movement screamed. Other than the Valerie Plame outing and Jerry Sandusky coverup, investigations are plagued by people taking the 5th. Now the hate Islam film trailer that would have gotten far more killed if Muslims in California started the protests like they were baited into doing, and Coptics didn’t complain so quickly and if an American died whose relatives cried out for vengeful against Islam. So far, Jesse Ventura’s analogy of the two parties resembling professional wrestling is the most cogent. In a public venue, Dems and Repubs are mortal enemies. Behind closed doors, they’re willing to obtund any situation that might reveal the skulduggery that actually goes on. As we approach the “fiscal cliff”, I’m sure the Dems will do everything they can to make the “Grand Bargain” look like a “kinder, gentler” solution,and both parties will appear rational and reasonable. Meanwhile, as usual, we’re all gonna get shafted. Johnson should have screamed “treason” at the top of his lungs. Instead, another 20,000 Americans gave up their lives to the grand charade.